Sydney Shop Girl: Early For Work On A Friday. I don't think I could have written a post today without starting here. They're home from Afghanistan for Christmas. 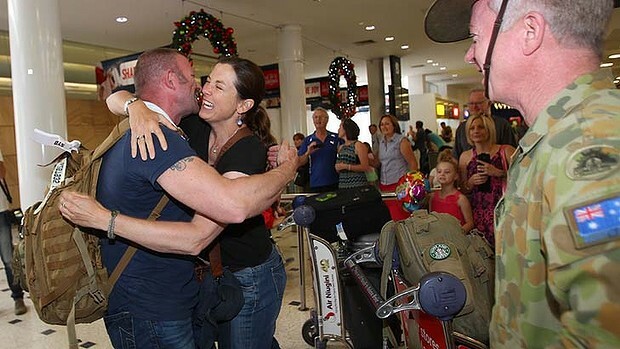 May this be a very merry Christmas for the Australian armed forces personnel who are now safely back in Australia with their families this year. May your favourite beer be chilling in the fridge for you right now and you enjoy the simple pleasures of life in this country that the rest of us take for granted - the clean running water, the beaches, the order and the freedom. The first heatwave of summer has officially arrived in Sydney today so I got myself to work extra early to beat the heat and the traffic dramas that always seem to accompany it. Even the owls in the 'snow' at Westfield were coping poorly this morning. Shopping centres first thing in the morning are different beasts to what they are come lunchtime or late afternoon. There's a stillness and silence that echos off the just cleaned, glossily smooth flooring. With just natural light filtering in wherever it gets the chance, the 'buy more, be more' gleam that usually bathes the immaculate window displays isn't as palpable. There's excitement in the food hall. The purveyors of my favourite dark chocolate skinny mochas (after Max Brenner) are finally opening a branch to enable me to get a weekday fix down the road from work. Mid December has come and gone but the workmen who were there today looked too harried for me to risk asking them when the actual opening date is. But the light fittings are up and the menu too so hopefully I won't have much longer to wait. Thanks to a tip off from S, I also managed to get a head start on the Sambag sale this morning. With my coffee in one hand and the mouse in the other, I managed to find the flats I needed in the colours I needed. Plural. I got shipping confirmation within minutes of my order going through so hopefully I'll be able to show you what I bought very soon. We had our Christmas lunch for work this week. It was on Wednesday and I'm still feeling full today. I cheated and brought along this sushi platter. We were thoroughly spoiled though with home made kofta, briyani, rocky road and pavlova amongst many other good things. I figure that with it being less than a week now until Christmas, having dessert with every meal is perfectly acceptable. Dress - ASOS, necklace - Red Phoenix Emporium. My Michelle Obama dress from ASOS refuses to show its age. No matter how many times I've put it through the washing machine. I wore it to lunch with my new RPE necklace. Is this one of the prettiest arrangements of artificial flowers you've ever seen at a garden store? I was at Flower Power yesterday and almost couldn't leave. Everything looked so beautiful, even the compost and fertilizer corner looked so inviting I almost imagined myself embarking on a major overhaul of my long neglected front garden. Almost. Have a lovely weekend! Stay cool, wherever you may be.